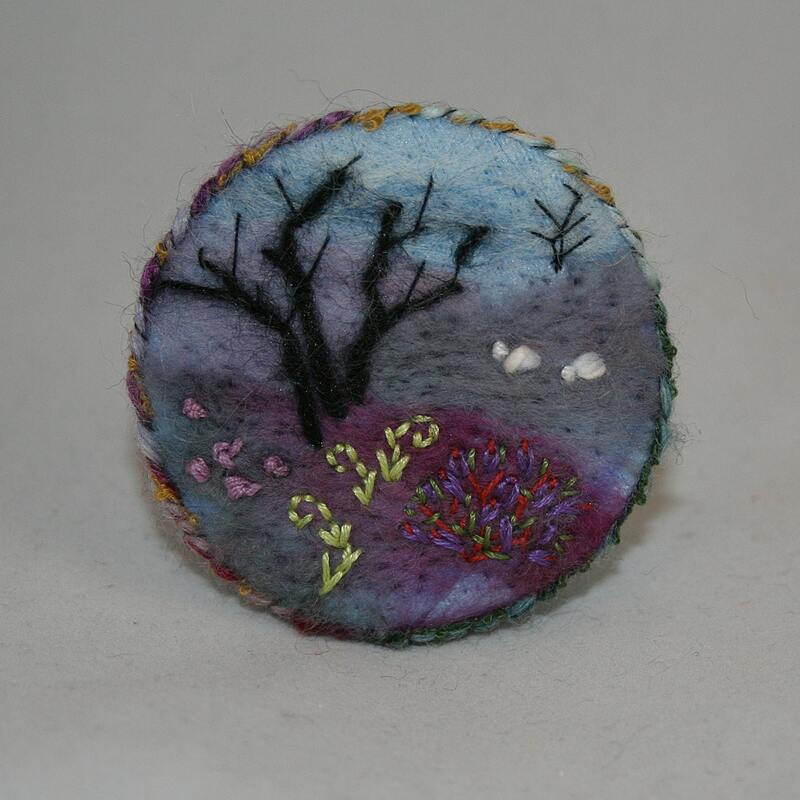 A pretty, felted and embroidered landscape design decorates this brooch. One of a series of embroidered felt items inspired by my library of photos from our wanderings - each embroidery unique in composition. The background of this brooch has been created by felting an assortment of hand dyed fibers to a fleece fabric background, using an embellisher machine. Details of the composition have been added by hand embroidery. The tree is stitched from partially un-ravelled mohair yarn, the sheep and heathers are stitched in a selection of cotton threads, linen floss and tapestry wools..
Couching, over a slubbed yarn in moorland shades, frames the design. The brooch is stiffened by plastic cut from a recycled bottle over which the embroidered fleece is stretched. The back of the brooch is neatened with commercial felt and a brooch pin is securely stitched in place. Folksy :: Buy "Heather pot"